Daniel is not alone. Virtually all of his neighbours who farm the hard, rocky slopes of Konso in the Great Rift Valley in southern Ethiopia face the same plight. Little rain has fallen in the district for a year, and that has spelled disaster for those whose crops depend entirely on the water that falls from the skies. That includes just about everybody who dwells in the stone-walled villages that perch on Konso’s many hilltops, 600 kilometers south of Addis Ababa. Close to 98 percent of the district’s 250,000 people live off the land, tilling small, often tiny, plots of terraced land sculpted out of Konso’s hillsides. In good years, Konso’s farmers produce two crops a season, one planted during the February-to-April “belg” rains, another during the August-to-November “meher” rains. The belg rains are the most important in Konso, a distinction from other parts of Ethiopia. Accounting for 80 percent of the district’s annual agricultural production, the short, springtime belg rainfall supports mostly maize, sorghum, barley, wheat, green beans and teff, the grain used to manufacture the ubiquitous flat, spongy, Ethiopian bread known as injera.. The goats, perhaps, but not Daniel’s wife, nor any of his eight children. Their survival will depend on outside assistance, much of it supplied by WFP. The Konso farmer and his family are among the more than 7 million people in Ethiopia whom WFP is currently helping with emergency food rations. All have fallen victim to twin threats – the prolonged drought that is ravaging large swathes of Ethiopia compounded by the global phenomenon of soaring food prices. Daniel’s case is typical. 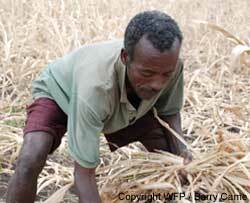 Successive failures of seasonal rains have destroyed his crops, endangering his livelihood. At the same time, skyrocketing market prices for food have outstripped his ability to come up with the cash to buy alternative supplies. Like 7.5 million other Ethiopians, Daniel is a participant in the Ethiopian government’s innovative Productive Safety Net Programme (PSNP), a scheme designed to lift poor families out of chronic food insecurity by creating community assets – roads, bridges, terraces, wells, watering ponds etc. – and minimizing the loss of household assets like farm tools, laying hens, milking cows, ploughing oxen and other livestock. 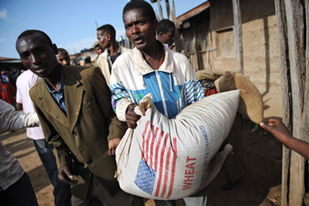 Recipients receive either a monthly cash grant of 30 Ethiopian birr (roughly US$3) or a monthly food grant, supplied by WFP, of 17 kg of cereals, usually maize or wheat, in return for participating in various public works. But Daniel’s 30 birr is not going to buy much on the local markets in Konso: where a quintal of maize, which cost 150 birr a year ago, now costs 600; where a quintal of teff has doubled to 900 birr over the same period. To come to the aid of Ethiopians trapped in plights similar to that facing Daniel, WFP is planning to deliver US$384 million worth of food relief assistance to more than 4 million people affected by the drought. WFP will also extend food assistance to another 3 million people enrolled in the PSNP in drought-stricken areas. Food supplies to support this effort have proven difficult to obtain. The relief effort is currently short some 123,000 metric tons of mixed commodities, valued at more than US$99 million, while supplies for PSNP beneficiaries lag 38,000 metric tons, worth US$30 million. The shortfalls have forced WFP, in consultation with the Ethiopian government, to cut the monthly rations for beneficiaries by one-third, reducing the cereal ration from 15 kgs to 10 and trimming the non-cereal ration to three kg of blended food, one kg of pulses and 0.3 kgs of vegetable oil. In places like Konso, where more than one-third of the population is in need of food assistance, the ration cuts have had a severe impact. Among those most affected have been the children. Malnutrition among children under 5 is on the rise in Konso, as in some other areas of Ethiopia hardest hit by the drought. Close to 700 children are currently being treated at Konso’s stabilization centre, a health clinic set up to deal with the most severe cases, or in the district’s nine therapeutic feeding centres. To help deal with this problem, WFP is working with government health officials as well as UNICEF and NGOs to provide targeted supplementary feeding in drought areas across Ethiopia to 737,000 pregnant women, nursing mothers and children under five years of age who are suffering from moderate acute malnutrition. One of those centres operates not far from Daniel’s ravaged maize crop, in the village of Fasher. Several hundred women are gathered on the grounds of an elementary school, receiving lessons in basic nutrition while they await delivery of food rations designed specifically to combat malnutrition. Every three months, the women receive 25 kg of blended food fortified with 23 vitamins, minerals and other micronutrients as well as three litres of vegetable oil fortified with vitamins A and D.
In addition to the thrice-monthly ration, the women also receive nutrition lessons, learning about correct food proportions, proper breast feeding and the need to provide complementary foods to young children. Nearly 17 million people in the Horn of Africa are in urgent need of food and other aid – almost twice as many as earlier this year, the UN has said. Some $700m (£382m) in emergency aid is needed to prevent the region descending into full-scale famine, it said. Top UN humanitarian official John Holmes said food stocks were critically low in parts of Ethiopia, Somalia, Eritrea, northern Kenya and Uganda. The area has suffered from drought, conflict and rocketing food prices. The number of those at risk could rise still further “as the drought deepens and the hunger season continues”, Mr Holmes said. The estimated total for the rest of this year for those in need is $1.4bn. Almost half of that has been raised, Mr Holmes said, but there remains a shortfall of $716m. “We may need significant funds after that period – this is not the end of the story,” he said. The UN Food and Agriculture Organisation blames worldwide rises in food prices for helping to push 75 million more people into the ranks of the world’s hungry last year – bringing the total to 925 million. It was at a railway crossing near Diri Dawa, the provincial capital in the Ethiopian Ogaden desert, that I saw them: small children’s hands, blackened by sun, clutching at the slats of a cattle truck dumped on a siding. 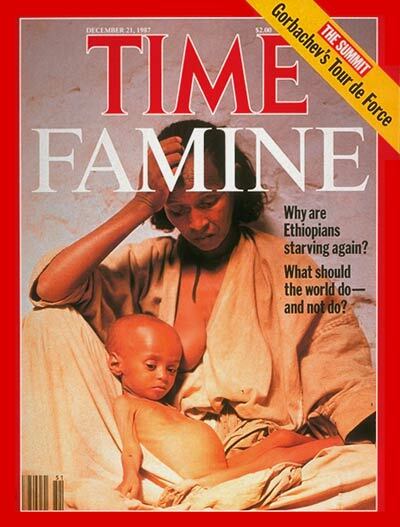 The year was 1984, the height of the Ethiopian famine that claimed about a million lives. These young things must have expired, hours later, of heat and thirst in temperatures peaking at about 48C, in the truck where they had deliberately been left to die. I know it was deliberate because I took quick photographs, muttered a few words they couldn’t understand, and headed in to Diri Dawa to get help. The famine relief office officials shrugged and directed me to the military police commander. He cut me short: yes, he knew where they were. They were ethnic Somali kids – Somalis, the majority population of the Ogaden, had been in rebellion against Ethiopian rule for years – and they had been caught throwing stones at a train. You did not have to be caught throwing stones to “pay the price” in 1984. That famine in the Ogaden, the worst-affected region in Ethiopia, was far deadlier than it need have been because, until the international outcry forced it somewhat to relent, the Marxist Mengistu dictatorship blocked food aid to rebel areas, using it as a weapon of war. What the world saw back then they are seeing again: heart-rending photographs of wide-eyed famished Ethiopian children. What the world did not hear much about then was the criminal exploitation of suffering. What the world will not see clearly, even now, is that disasters like drought can cause crops to fail, but should never, in a half-decently run country, lead to mass deaths from malnutrition. 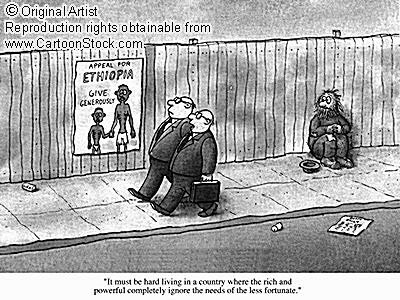 Famines in this day and age are man-made, if not by the sins of commission perpetrated by the thuggish Mengistu regime (and by North Korea’s) then by culpable omission coupled with lousy policies. Mengistu was overthrown in 1991, fleeing Addis Ababa to retire in the congenial climate of Robert Mugabe’s Zimbabwe. Because Meles Zenawi, the Tigrayan rebel leader who ousted him, shed some of his Albanian-model Stalinist baggage, he was fêted by Westerners as a moderniser and showered with development aid. A spot of election-rigging in 2005, followed by the shooting of up to 200 pro-democracy demonstrators, caused some temporary tut-tutting, after which aid quietly resumed and, in Britain’s case, doubled. Not so quietly, the Ethiopian Army is again cracking heads in the Ogaden, burning villages and, according to Human Rights Watch, torturing and publicly executing not only rebels of the resurgent Ogaden National Liberation Front but also civilians sympathising with them. In the Ogaden, famine looms. Plus ça change. Still, Meles and Mengistu are not la même chose. Meles is a bit of a thug, but he has introduced some judicial and commercial reforms, devolved powers from Addis Ababa to the regions, improved education, curbed child mortality through anti-poverty programmes and, importantly, advocated greater equality for women. He has also ploughed 17 per cent of government spending into agriculture, three to four times as much as most other African governments. He claims that farm production is growing by 10 per cent a year, and boasts that, two years ago, the country actually exported maize (odd, that, when in a “good” year millions of Ethiopians rely on foreign food aid). After the last big drought, in 2003, the Ethiopian Government worked with donors to create a system designed to make famine history. It includes a Productive Safety Net, a public works programme providing seven million poor Ethiopians – nearly a tenth of the population – with food or cash, and a Famine Early Warning System that measures rainfall, livestock prices, household spending and signs of malnutrition. Textbook stuff, and in stark contrast with the junta’s attempt to hide the 1984 famine from the world. And yet… how, then, has the failure of the “little rains” this spring, and the consequent loss of a single harvest, translated into a huge emergency affecting ten million people, by the aid industry’s probably inflated account, and 4.6 million by the Government’s defensively conservative assessment? Why are its emergency grain reserves so depleted that food rations have been reduced by a third, at least 75,000 children are already severely malnourished and hunger affects two thirds of the country and has, this time, spread to the towns? Why is Ethiopia, a country with lush two-crop breadbaskets as well as deserts and eroded hill farms, still so vulnerable that, as Meles himself admits, “one unexpected weather event can push us over the precipice”? There are two big causes, and drought is not one of them. They are within the power of politicians to tackle, and tackled they must finally be, with the requisite sense of urgency. The first is Ethiopia’s population explosion; with families averaging 5.4 children, it has soared from 33.5 million in the 1984 famine to 77 million now. In a country where 85 per cent of the people rely on farming for a living, this means that, per head, food production has actually fallen since 1984 – by more than a third – and farm plots get smaller and smaller. A fifth of Ethiopian farmers try to survive on areas no more than 20 metres by 40 metres per person, yielding no more than half their cereal needs. The second is Meles’s purblind refusal to reverse the Marxist folly of his 1995 law that put all land under state ownership. “Land holding certificates” graciously permit farmers to till land that their forebears have farmed for generations; but surveys show that 46 per cent still expect to lose their farms. The policy is a disaster. It discourages careful land management; it deprives farmers of collateral to raise bank loans to buy fertiliser and agricultural tools; and they cling to plots too small to feed their families because, with nothing to sell, they have no alternative. The coffee and infant rose-growing sectors apart, most Ethiopians farm as their ancestors did, with hoes, wooden ploughs, oxen and an anxious eye on the skies. Enough food aid is once more pouring in to stave off serious famine; but it will not remedy Ethiopia’s deepening aid dependency and rural despair. With a smaller – because more mobile – landowning rural population, able to access loans to invest in higher-yield seeds, tractors and drip irrigation, Ethiopia could feed itself. But will donor governments champion the farmers’ right to get back their land? On past experience, pigs will fly. And the next famine will be a matter of time.